At Oceaneering, we aim to deliver innovative solutions for your toughest renewable energy project challenges. We are ideally positioned to serve your global offshore wind, tidal, wave, and interconnector projects with facilities in key regions, such as the U.K., the U.S., and Brazil. The transition from fossil fuels to renewables creates many obstacles for successful projects. Larger turbines, stronger currents, arduous seabed conditions, and environmental considerations all add risk to your project. From routine to extreme, our long-standing offshore experience, innovative products, tools, and services safely de-risk operational systems, increase reliability, and lower your total cost of ownership in the harshest environments. Our survey experience, coupled with our own expansive fleet of Jones Act-compliant vessels, offer high-speed data transfer solutions to move your survey data from work vessel to shore, enabling faster shore-based batch processing. Our engineering and design expertise, along with state-of-the-art facilities, will support the manufacture and delivery of medium- and high-voltage power cables. Our vessels have installed nearly 1,000 mi of subsea products, and we are well-equipped to meet your project needs with our fleet of ready-to-mobilize vessels, ROVs, survey spreads, and installation equipment rentals. The SCAR Seabed Trenching System combines plough and water jetting systems to offer a market-leading boulder clearance, pre-cut trenching, backfill, and jetting service. 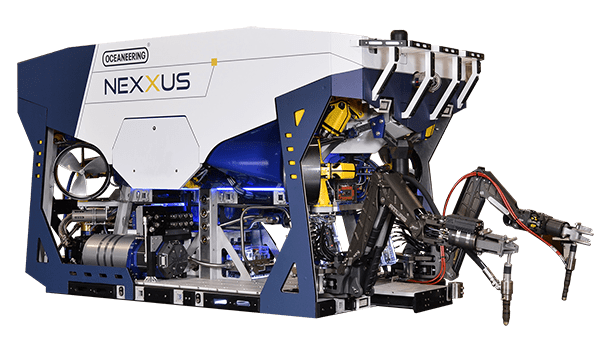 Our asset maintenance solutions, from robotic crawler inspections to subsea marine growth removal, meet the demands of large assets that are installed in harsh environments. Our decommissioning services enable the safe removal and disposal of cables, monopiles, and other subsea structures.